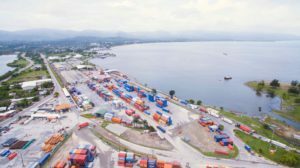 Operadora Portuaria Centroamericana (OPC), part of the ICTSI group and the container terminal operator at the port of Puerto Cortés in Honduras, has announced the progress in the extension of its facility. Having won the international bid for design, finance, construction, maintenance and operation of the specialized container and cargo terminal in the Republic of Honduras in February 2013, ICTSI was awarded a 30-year concession and established Operadora Portuaria Centroamericana to operate the terminal. The company committed to invest USD 624 mln in the terminal in order to facilitate the development of a competitive logistics of the country and the Central American region. By now, USD 90 mln have been invested in the equipment and infrastructure of the existing facilities. Currently, the company plans a further large investment of USD 145 mln in 2017-2018 in the new container terminal at Puerto Cortés. The year 2017 has been very important for Puerto Cortés not only due to the increase in the productivity and efficiency of vessel handling operations, but also due to the upgrades carried out at the terminal. In 2017, OPC initiated the construction of a new berth, 350m long and 14.5m deep, which will be equipped with 2 Super Post-Panamax STS cranes and will be put into operation in 2018. The terminal operator also informs of investing USD 5 mln into the construction of a new container depot, which will be completed in December this year and will become the major facility of the kind in the whole Central American region. According to OPC, the capacity of the container terminal at full development will reach 1.8 mln TEU. The facility will be able to handle the largest neo-panamax containerships transiting the Panama Canal.